Mr Muscle Oven Cleaner promises a shiny oven with no scrubbing. It’s a household detergent that is designed to cut through grime and baked on stains and spills – but is it all it’s claiming to be? It’s a popular choice for oven cleaning, though it may not be able to shift very thick and stubborn residue, and you may not be able to use it on many oven components. Mr Muscle Oven Cleaner is a very strong household cleaning agent. After our review of the fine print, we give our advice on how and when to use it, and when not to. Before you buy any oven cleaning products, check what type of oven you have. Most household cleaning products, including Mr Muscle, are not suitable for self-cleaning ovens. 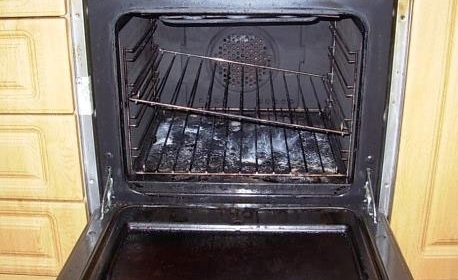 The high temperatures these ovens reach can cause problems with the chemicals involved which can damage your oven. Mr Muscle is also not suitable for use on microwave ovens or exterior ovens. If you’re unsure about your oven check the manufacturer’s instructions, which can be found online if you’ve lost the manual. 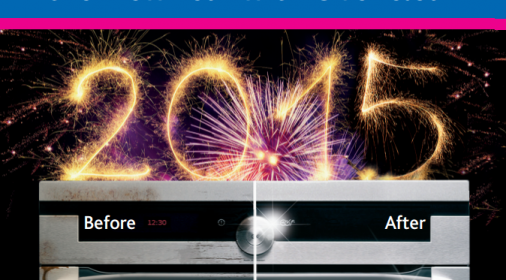 If you want your entire oven to sparkle, it’s best to call us on 0800 145 5118. Mr Muscle Oven Cleaner is only designed to clean inside the oven. You can use it on the internal walls and the glass door. But don’t use it on the hob or any external materials or dials. The product is also not suitable for use on chrome, aluminium, zinc, copper, plastic or polished or lacquered surfaces. If in doubt – don’t risk it, as this can cause unsightly corrosion. Never spray it on the oven trim or seals, pilot light or heating element as the chemicals could damage these parts. Although we use heat in our impeccable oven cleaning process, Mr Muscle can only be used on cold ovens as heat can react with its ingredients. Switch off all electricity to the oven or turn off the pilot light. Put plenty of protection on the floor around the oven and cover any adjoining surfaces. Make sure to remove the oven racks too. Mr Muscle’s Oven Cleaner contains sodium hydroxide as its main active ingredient. But it’s a chemical that can cause burns if it comes into contact with your skin. Always wear rubber gloves and point the can away from your skin when spraying. Do not inhale the spray or get the product in your eyes. If you get any spray on your skin, rinse with plenty of water for at least 20 minutes, as this can be extremely harmful. Many people are sensitive to the harsh fumes released by household detergents. Mr Muscle Oven Cleaner is a powerful agent and can create some very strong fumes, so we recommend only using the product in well-ventilated areas. Open all windows and doors in the kitchen for the duration of the application, and keep pets and children away from the area. Always follow the instructions on your can. There is more than one type of Mr Muscle Oven Cleaner and they may have slightly different instructions. Shake the can well. Spray onto your oven’s interior surfaces from a distance of 20 to 30cm, keeping the can upright at all times. Close the oven door and leave the product to work. For some Mr Muscle products, the instructions state to leave for no more than 30 minutes, while other products can be left for up to two hours. When the time is up, open the door and wipe the oven out thoroughly with a damp cloth to remove all traces of the cleaner. Wear rubber gloves to do this. Ventilate the oven well before turning the electricity back on. No, always follow the instructions on the product you have bought. 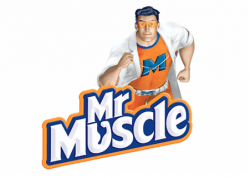 Mr Muscle is a strong household cleaner and should not be left on for longer than directed. Help! My oven is still dirty! 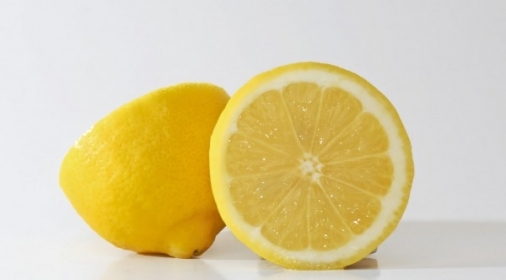 For stubborn stains or heavily soiled ovens, you may not be able to get it clean with a leave-on detergent. If you don’t want to scrub your oven to get it clean, just call in the professionals! Ovenclean specialises in deep cleans and use non-caustic cleaning products for a gentle, thorough clean. 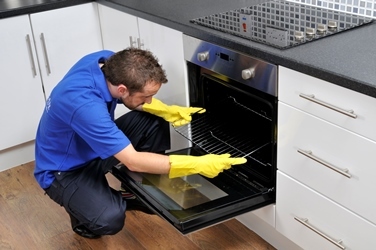 Get a no-obligation oven cleaning quote online today.